« Jagnhwa Hongreyeon Jeon and A Tale of Two Sisters – Cinderella by another name. 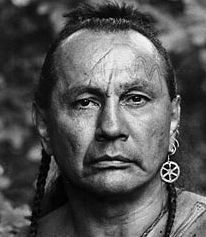 Sitting here, checking my email, I see that Russell Means has died. I actually realized I have tears in my eyes over this. There may be a lot of people today who don’t know who this man was. This is the image with which most people will be familiar. He was an Oglala Sioux who worked very hard to bring the plight of the American Indians to the attention of everyone else in this country. He made some bad choices in his life, and occasionally in the way he handled some incidents. But he was a man who had a hard youth, overcame his additions, found a cause, and devoted himself to trying to make this country a better place. He didn’t isolate himself to just helping his own tribe or just North American tribes. He was an activist for all indigenousness peoples on the American Continents. After fighting the ‘system’ he also tried to work within the political machine as a Libertarian. When he was older, he did a little bit of acting and wrote an autobiography, “Where White Men Fear to Tread”. His entire life was about overcoming: overcoming alcoholism, overcoming drugs, overcoming bad choices. He still made questionable choices. He is a good example of a person who tried to be good, to do good, but sometimes fails, sometimes does the wrong thing, and has to never stop trying to rebuild. SIOUX FALLS, S.D. 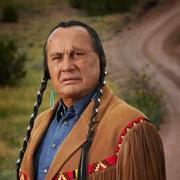 (AP) — Russell Means spent a lifetime as a modern American Indian warrior. He railed against broken treaties, fought for the return of stolen land and even took up arms against the federal government. 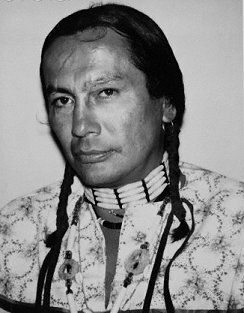 Means, who died Monday from throat cancer at age 72, helped lead the 1973 uprising at Wounded Knee — a bloody confrontation that raised America’s awareness about the struggles of Indians and gave rise to a wider protest movement that lasted for the rest of the decade. Before AIM, there were few national advocates for American Indians. Means was one of the first to emerge. He sought to restore Indians’ pride in their culture and to challenge a government that had paid little attention to tribes in generations. He was also one of the first to urge sports teams to do away with Indian names and mascots. There were plenty of American Indian activists before AIM, but it became the “radical media gorilla,” said Paul DeMain, editor of News from Indian Country, a national newspaper focused on tribal affairs. “If someone needed help, you called on the American Indian Movement, and they showed up and caused all kind of ruckus and looked beautiful on a 20-second clip on TV that night,” DeMain said. But Means’ constant quest for the spotlight raised doubts about his motives. Critics who included many fellow tribe members said his main interest was building his own notoriety. Authorities believe three AIM members shot and killed Annie Mae Aquash on the Pine Ridge reservation on the orders of someone in AIM’s leadership because they suspected she was an FBI informant. Two activists — Arlo Looking Cloud and John Graham — were both eventually convicted of murder. The third has never been charged. With his rugged good looks and long, dark braids, he also was known for a handful of Hollywood roles, most notably in the 1992 movie “The Last of the Mohicans,” in which he portrayed Chingachgook alongside Daniel Day-Lewis’ Hawkeye. He also appeared in the 1994 film “Natural Born Killers,” voiced Chief Powhatan in the 1995 animated film “Pocahontas” and guest starred in 2004 on the HBO series “Curb Your Enthusiasm. Means always considered himself a Libertarian and couldn’t believe that anyone would want to call themselves a Republican or a Democrat. Means recounted his life in the book “Where White Men Fear to Tread.” He said he pulled no punches in the autobiography, admitting to his frailties but also acknowledging his successes. Means’ death came a day after former Sen. George McGovern died in Sioux Falls at the age of 90. McGovern had traveled to Wounded Knee with then-Sen. James Abourezk during the takeover to try to negotiate an end to hostilities. Oglala Sioux Tribe spokeswoman Donna Salomon said wake services for Means’ will be Wednesday on Pine Ridge, and his ashes will be scattered in the Black Hills on Thursday. This entry was posted on October 23, 2012 at 12:35 pm and is filed under Education, History, Politics with tags American Indian Movement, Associated Press, Black Hills, broken treaties, Death Of, Indian, Indians, Lakota, Native Americans, north american tribes, Oglala Sioux, Passed Away, Pine Ridge, Russell Means, Sioux, South Dakota, Where White Men Fear to Tread, Wounded Knee 1973. You can follow any responses to this entry through the RSS 2.0 feed. You can leave a response, or trackback from your own site.